relatively large particles from gas streams. - Static separators are relatively inexpensive since they have no moving parts and they are easy to operate. 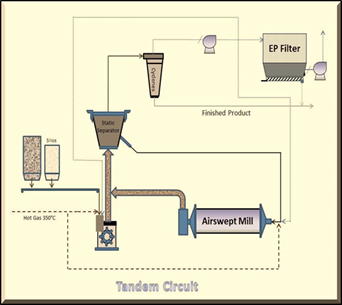 - The material enters with the air stream at the bottom of the separator. 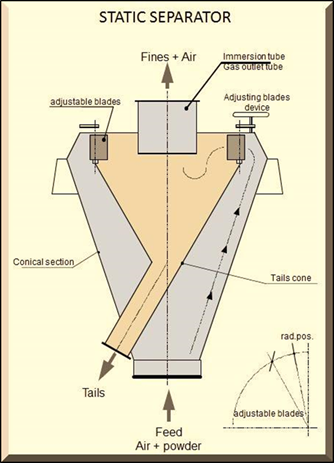 - A vortex is created in the upper part of the cone of the separator because of the blades. - The coarse material goes towards the walls because of the centrifugal force, slides to the bottom and leaves the separator. - The fine material exits through the top of the immersion tube. - The fineness of the product is adjusted by changing the position of the blades. - When the blades are in radial position (maximum of opening), the product of the static separator will be coarser. particle increased and the cut size decreased. and the cut size goes up again. - This separator is from KHD Humboldt Wedag AG. 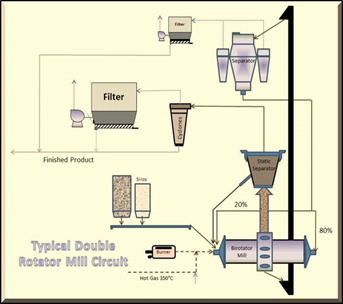 - The V-separator is generally used with a pregrinding system (Roller Press). - Applications mainly for raw meals, clinker and slag. to decrease the problems of vibrations. can be used (for example) for slag, the Roller Press being a finishing system. - As its name suggests, the V-separator V has a V-shaped. - The material enters by the top and falls on a series of inclined plates. - The largest particles fall by gravity and leave the separator at the bottom . 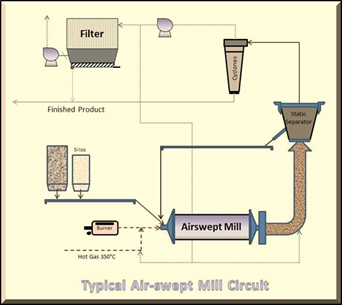 - Intake air feed in the separator on one side and sweep the fine particles from the material cascading. - The separation zone is therefore between the inclined plates and a series of deflectors inclined in another direction. - In case of hot material (clinker), a significant cooling is possible. - At the contrary, in case of humid material (raw meal), a significant drying is possible. 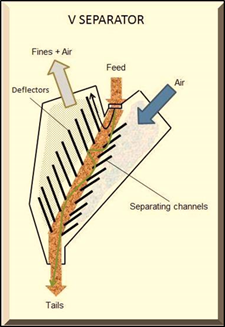 - The cut size (or fineness of the product) of the V-separator is controlled only by the airflow quantity.